The Iranian regime is facing countless pressures both at home and abroad, but perhaps the most pressing stems from US President Donald Trump’s decision to withdraw from the nuclear agreement Tehran signed with the West in 2015. Trump simultaneously announced that the US would re-impose economic sanctions against Iran in two phases, giving foreign companies that re-entered the Iranian market after the signing of the nuclear agreement 80 days to comply with the first phase and 180 to comply with the second. As Tehran contends with mounting discontent at home over the country’s economic straits, President Hassan Rouhani finds himself in an awkward position. Unable to produce quick enough results to make the economic paybacks of the nuclear deal felt among Iranian society at large and under constant fire from the hardliner camp, he has had to intensify his efforts to rescue the nuclear agreement, whether through threats or negotiations. From the moment Trump entered the Oval Office in January 2017, the fate of the nuclear deal signed between Iran and the five permanent members of the UN Security Council plus Germany (the P5+1) hung in the air. Just over a year later in May 2018, and in spite of the efforts on the part of other Western nations to dissuade him, he announced the US withdrawal from the agreement. In a televised speech, Trump said the deal would not prevent the Iranian regime from obtaining nuclear weapons capacity. The US decision to withdraw from the deal left Tehran with the choice of either continuing with the deal in the absence of its most important signatory and with the re-imposition of painful sanctions or withdrawing from the deal altogether, which would plunge the country into isolation and even more dire economic circumstances. It appears that Tehran has opted to retain the leverage of the threat of withdrawal as a way of persuading the other partners in the deal to remain committed to it. Iranian officials have been negotiating with their European partners to salvage the deal and obtain European guarantees to compensate for the losses resulting from US sanctions. The Europeans have demonstrated an eagerness to work with Iran towards these ends, despite the pressures from Washington. In the hope of salvaging the accord, the foreign ministers of the remaining signatory countries met in Vienna on 6 July. 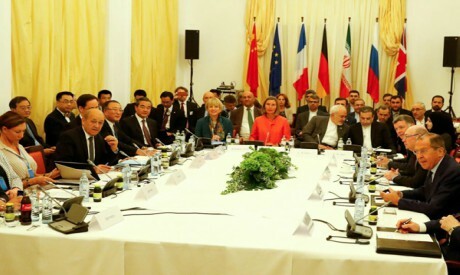 In the first such meeting since the US bid to scuttle the agreement, the participants discussed Iranian concerns following the re-imposition of US sanctions as well as a mechanism to implement the European Commission’s initiative to contain the repercussions of US sanctions on Europeans investing in Iran. Before the meeting Rouhani visited both Switzerland and Brussels. The Vienna meeting concluded with a statement that was positive from Iran’s perspective since the signatories to the agreement, apart from the US, expressed their support for Iran’s right to export oil and gas despite US sanctions and agreed to continue talks over economic measures that would ensure the continued implementation of the agreement. France took the opportunity to insist that Iran stop threatening to renege on its commitments under the agreement and that it recognise Israel’s right to exist. Russia, China, Germany, France and Britain together with Iran now need to hammer out a package of economic measures to protect foreign investments in Iran before the first phase of the US sanctions kicks in in August. The broad outlines of such a package exist, including loans from the European Investment Bank and safety nets to protect European companies from US sanctions. In addition, the European Commission has suggested that European governments transfer funds directly to the Iranian Central Bank to avoid US sanctions. The EU has also expressed its determination to reactivate a 1996 law in order to protect European companies from the consequences of renewed US sanctions against Iran, though this assurance has not stemmed the tide of major European firms withdrawing from Iran. The Danish shipping giant Maersk, France’s Total oil and petroleum company, the Italian Danieli steel manufacturer and the Norwegian Saga Energy company are among the major European firms that have shut down their operations in Iran. Royal Dutch Airlines has announced that it will halt direct flights to Tehran on 22 September this year. The flight of European investment from Iran for fear of US sanctions is one of the most difficult obstacles facing attempts to keep the Iranian nuclear deal alive. Iran desperately needs foreign investment in order to stimulate the economy and revive its economic infrastructure which has been battered by years of sanctions. Most foreign firms are investing in the oil and gas sector, which has deteriorated significantly and needs large injections of money and expertise in order to rebuild and return to world markets. However, this is also contingent on the fulfillment of Western promises to ensure that Iranian oil can continue to flow into world markets despite the US pressures on importers of Iranian crude oil. The Western countries are facing an uphill battle to fulfil such promises. Iranian officials know this, which may explain why several Iranian officials in statements following the meeting in Vienna said that Tehran was waiting for Western guarantees to go into effect to enable the nuclear accord to survive.